Even though the weather is still hot outside, it won’t be long before temperatures dip below freezing. That means you still have time to order the perfect horse barn for your property and for your animals. At Yoder’s Dutch Barns, we offer several barn styles to fit a wide variety of needs and budgets. 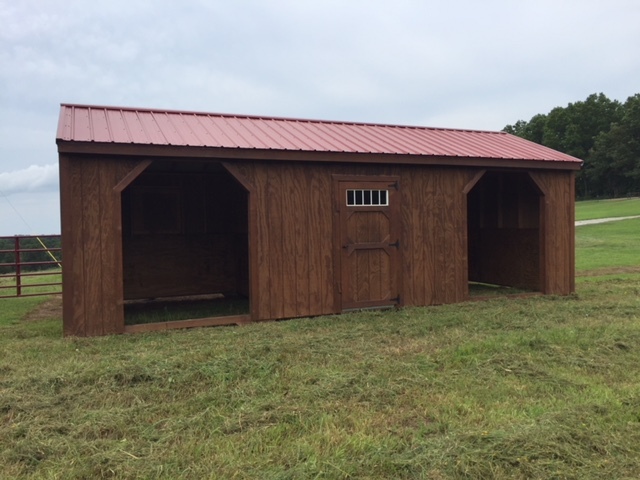 Our barns can be custom built to different sizes and specifications, and each barn comes with the customer’s choice of a metal or shingle roof and a 12-month warranty by default. We stand behind our structures, and that’s because we’re licensed professionals who perform quality workmanship on every project and order we complete. In fact, we offer a satisfaction guarantee on our products, including our prebuilt horse barns. It’s our goal to make it as easy as possible for our customers to get the portable horse barns they need where they want them and on time. To accomplish that, we make our horse barns and run-ins portable. That means we can quickly and easily transport a barn to your property and place it exactly where you want it in a manner that’s as hassle-free as possible. Portability isn’t just convenient for transporting and setting up barns, either. It also means you can move your barn in the future as your needs or property change. Want to learn more about our horse barns? Ready to place an order? Call us at (615) 789-1030 or submit an online order form to get in touch with our sales representatives. You can also visit our showroom and facility at 5162 Highway 48 N in Cumberland Furnace, Tennessee, to view our structures, including our horse barns and run-ins, in person before you buy.